Just in case you are thinking “who the heck is Fancy Nancy?”, she is the latest craze in books for girlie girls ages 4 through 8 (although I know a ton of two year old girls who are hooked on the series, too). The books are written by Jane O’Connor and Illustrated by Robin Preiss Glasser, and have been on the New York Times Best Sellers list for 26 weeks (as of the time of this post). Whilst the series certainly celebrates ‘looking your best’, it is extremely down to earth. Fancy Nancy (Nancy Clancy is her real name) is sweet natured and it won’t bother you at all that the Fancy Nancy epidemic is completely infectious – spreading from one little girl’s house to the next! Synopsis: Meet Nancy, who believes that more is ALWAYS better when it comes to being fancy. From the top of her tiara down to her sparkly studded shoes, Nancy is determined to teach her family a thing or two about being fancy. How Nancy transforms her parents and little sister for one enchanted evening makes for a story that is funny and warm — with or without the frills. 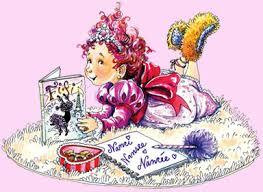 Synopsis: Fancy Nancy is back! And when her family decides to get a dog, she’s certain she can be fancier than ever. After all, a papillon—a small, delicate, fluffy dog—is the ultimate accessory. But her family wants a large, plain dog. How unglamorous! With Fancy Nancy‘s trademark humor and warmth, Nancy discovers that real fanciness does not depend simply on appearance but more on a genuine joie de vivre, which is a fancy phrase for having lots of fun. able to overcome her disappointment? In this magical new story from bestselling duo Jane O’Connor and Robin Preiss Glasser, everybody’s favorite fancy girl gets a surprise lesson in fancy from her grandparents. Looks like fancy runs in the family after all! Links: The Dress-Up world of ‘Fancy Nancy’ – listen to an interview with Jane O’connor on NPR’s Morning Edition, March 10, 2008.